15 October 1917: Entered Army service as a Student at the Unteroffizier [Non-Commissioned Officer] Preparatory School Weilheim. 5 April 1919: Transferred for training to the Unteroffizier School Northeim. 12 September 1919: Transferred to Reichswehr Infantry Regiment 21. 21 February 1920-23 March 1920: Detached to the V. Course at the Brigade College Kassel. 1 October 1920: Transferred to Reichswehr Infantry Regiment 20. 1 January 1921: Transferred to Infantry Regiment 17. 6 May 1922-15 July 1922: Detached to the Officer Candidate Training Course in Braunschweig. 6 July 1922-8 July 1922: At the same time, detached to the Officer Selection Examination at Potsdam. 31 July 1922: Named an Officer Candidate. 21 September 1922-20 September 1923: Detached to the I. Course at the Infantry School. 21 September 1923-11 November 1923: Detached to the II. Course at the Infantry School. 1 May 1924-30 September 1924: Detached for the continuation of the II. Course in Ohrdruf. 1 December 1924: Transferred to the 14th Company of Infantry Regiment 17. 1 October 1925: Transferred to the 15th Company of Infantry Regiment 17. 1 April 1927: Transferred to the 10th Company of Infantry Regiment 17. 14 March 1929-18 March 1929: Detached for training in Pioneer Service to the 6th Pioneer Battalion. 1 October 1930: Transferred to the 12th Company of Infantry Regiment 17. 1 October 1931: Transferred to the 14th Company of Infantry Regiment 17. 1 October 1933: Placed at the disposal of the Chief of the Army Command – detached to the clandestine General Staff Course. 1 May 1935: Detached to the War Academy. 10 July 1937: Transferred into the General Staff of the Army. 15 October 1935: Detached to the General Staff of Army Service Center 4. 8 January 1937: Transferred into the General Staff of the Army. 10 November 1938: Chief of the 9th Company of Infantry Regiment 9. 15 June 1939: To the staff of the 29th Division. 1 July 1939: Operations Officer (Ia) of the 29th Division, on 24 August 1939 redesignated the 29th Infantry Division (Motorized). 23 December 1941: Deputized as Chief of the General Staff of the Higher Command “for Special Employment” XXXV. 15 April 1942: Führer Reserve in the Army High Command. 10 May 1942: Chief of the General Staff of the XXXX Army Corps (Motorized) on the Eastern Front. 25 July 1942: Führer Reserve in the Army High Command. 20 November 1942: Detached to the staff of the German Africa Corps. 7 December 1942: Chief of the General Staff of the German Africa Corps. 10 February 1943: Führer Reserve in the Army High Command/sick. 1 August 1943: Chief of the General Staff of the XXXXII Army Corps on the Eastern Front (from 2 March 1944 also served as Commander Crimea). 1 August 1944: Führer Reserve in the Army High Command. 8 August 1944-31 August 1994: At the same time, detached to the 13th Division Leader Course. 31 August 1944: Detached to the Short Course for Panzer Troop Officers in the Course of Higher Troop Leadership. 1 September 1944-17 September 1944: Commander of Division Group 256 (subordinated to Corps Detachment “H”). 17 September 1944: Delegated with the leadership the 256th Volksgrenadier Division in the Netherlands (formed by the redesignation of the 568th Volksgrenadier Division). 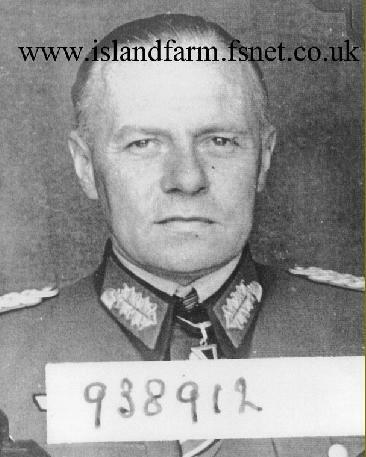 8 April 1945-1947: Prisoner of war. 5 May 1945 transferred to Trent Park Camp 11 sorting camp. 12 May 1948 transferred to Camp 186 for repatriation. Knight's Cross of the Iron Cross: 24 July 1941, Oberstleutnant i.G., Operations Officer (Ia) of the 29th Infantry Division (Motorized) in Russia. German Cross in Gold: 14 February 1944, Oberstleutnant i.G., Chief of the General Staff of the XXXXII Army Corps in Russia.